Last month the BBC website published a special feature by Quentin Sommerville and Riam Dalati titled “An education in terror“. As well as personal stories the feature includes a section with the heading “Curriculum of hate”. Readers learn that ISIS’ focus on indoctrination through ‘education’ began three years ago. “By July 2014, Mosul had fallen and the caliphate had been declared. The rich Iraqi city, six times bigger than Raqqa, had a lot more to offer in terms of human resources and infrastructure. Now, the Islamic State had both the expertise and the assets to take on the formidable task of drafting its own curriculum from scratch. This feature – described as a ‘resource’ in its URL – provides the BBC’s audience with information that will enhance their understanding of the ISIS terror group’s ideology and methodology. Interestingly though, the same audience has never been provided with such a resource on a comparable system that pre-dates the ISIS curriculum in Raqqa or Mosul. Neither have BBC audiences seen any comprehensive reporting on the issue of the incitement and glorification of terrorism found in Palestinian schoolbooks, official PA radio and TV children’s programmes and Hamas’ online children’s ‘magazine’. So as we see, while the BBC did consider a feature on “the Islamic State’s next generation of hate” editorially justifiable, it continues to avoid providing its audiences with information about the very similar indoctrination and abuse of Palestinian children. The missing men turned out to be members of Hamas but in its report on the story, the BBC did not clarify that they belonged to the terror group’s Izzadin al Qassam Brigades. “Whilst not stating so outright, like the above tweets this report clearly steers readers towards the impression that the four Hamas men travelling on the Cairo airport bound bus were abducted by members of the ISIS affiliate ‘Sinai Province’ which operates in Sinai. However, Hamas soon put out statements claiming that the men had been seized by Egyptian security forces rather than by the Sinai-based ISIS affiliate – which has not since made any mention of them in its statements. Now that story has taken another turn. “The Qatar-based Al Jazeera aired on Monday a photo that purports to show two Palestinians allegedly kidnapped by Egypt in the Sinai a year ago, in what could further deteriorate the relations between Hamas and Egyptian President Abdel Fattah al-Sisi’s regime. Al Jazeera apparently received the photograph via Hamas but whatever the real story behind it, BBC audiences are still unaware of the developments which have taken place since that one article was published in August 2015. Audience understanding of the related broader topic of the increasingly strained relations between Hamas and Egypt (which has long been both under-reported and inaccurately reported) would obviously be enhanced by some up to date coverage. 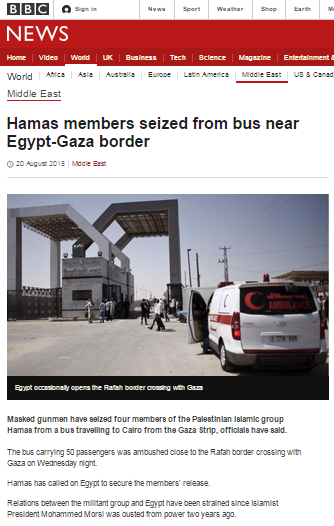 As was stated in the report which appeared later the same day on the BBC News website’s Middle East page under the title “Hamas members seized from bus near Egypt-Gaza border“, those “4 Palestinians” later turned out to members of Hamas but the BBC did not clarify that they belong to its Izzadin al Qassam Brigades. The incident took place during a rare three-day opening of the Rafah crossing by Egypt. The border between Egypt and the Gaza Strip has been mostly closed for the last two years and the last time it was opened was during Ramadan in June 2015. Nevertheless, the photograph used to illustrate this article is laconically captioned “Egypt occasionally opens the Rafah border crossing with Gaza”. Whilst not stating so outright, like the above tweets this report clearly steers readers towards the impression that the four Hamas men travelling on the Cairo airport bound bus were abducted by members of the ISIS affiliate ‘Sinai Province’ which operates in Sinai. However, as the Jerusalem Post’s Khaled Abu Toameh reports, Hamas appears to believe otherwise. “Initial reports claimed that the four – members of Hamas’s Izzadin Kassam armed wing – were kidnapped by an extremist Islamist group affiliated with Islamic State. Sources close to Hamas, however, accused the Egyptian authorities of kidnapping the men, who were among 50 Palestinian passengers who left the Gaza Strip through the Rafah border crossing. The sources claimed that one of Egypt’s security apparatuses was behind the abduction and held its government fully responsible for their safety. 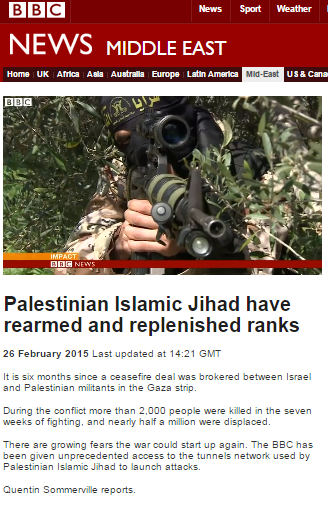 Whilst the issue of the Gaza branch of Hamas’ relations with Sinai-based Jihadists is clearly an important component of this story, it continues to be seriously under-reported by the BBC. 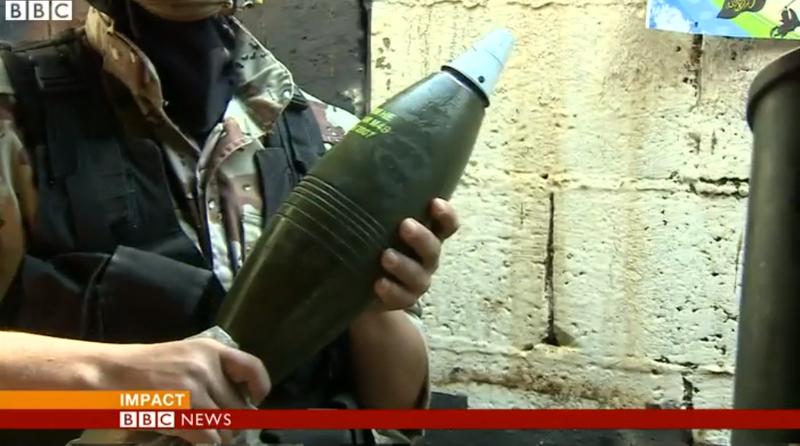 On February 26th the BBC’s Jerusalem Bureau’s Quentin Sommerville produced two reports – one written and one filmed – about the Palestinian Islamic Jihad in the Gaza Strip. Notably, BBC audiences are not informed at this juncture or at any other point in this report (or in the written article) how the PIJ has been able to rearm or who has supplied those weapons. Of course the likelihood of any future confrontation between terrorist groups in the Gaza Strip and Israel depends entirely upon the policies chosen by the former: for as long as they elect to refrain from attacking Israeli civilians, there will be no “next confrontation”. Sommerville, however, allows one of his masked interviewees to mislead viewers with the inference that Israel is the party initiating the recurrent bouts of conflict. 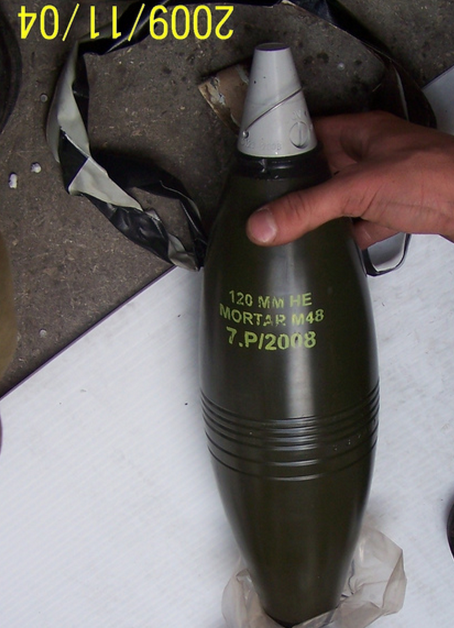 However, he refrains from commenting on the fact that the mortar marked ‘M48’ displayed by the PIJ terrorist he and his crew filmed bears a remarkable resemblance to the Iranian-made 120mm mortars intercepted by the IDF in 2009 aboard the ‘Francop‘ and of course he makes no effort to inquire where and how his hosts obtained their “ample supply”. The Gaza Strip’s western border is of course the Mediterranean coastline. Apparently just as geographically challenged as his colleague who recently described the Golan Heights as being west of Haifa, Sommerville is actually referring to the southern border of the Gaza Strip – as can be determined from the commentary which follows. No effort is made to explain to viewers why Egypt makes such statements. Of course there are also non-Western countries which take the same approach – now including Egypt. Sommerville fails to inform BBC audiences of the fact that the Gaza Strip has not been occupied by Israel since August 2005. 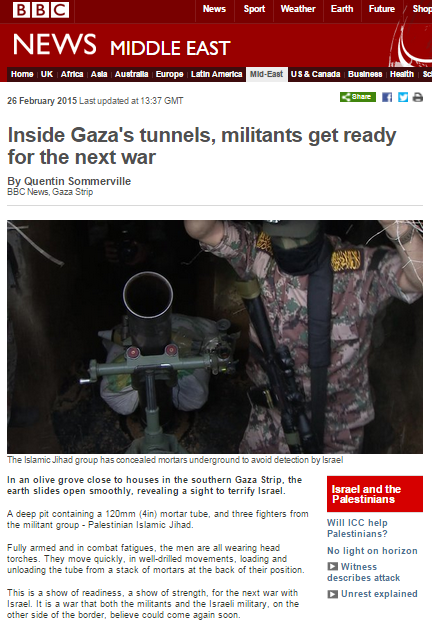 In the written version of his report – appearing in the Features & Analysis section of the BBC News website’s Middle East page under the headline “Inside Gaza’s tunnels, militants get ready for the next war” – Sommerville promotes some of the same themes. “Egypt’s soldiers move around in armoured vehicles. Border controls have been tightened and they are using explosives to destroy homes and smuggling tunnels that have been a lifeline to Gaza. He again makes no effort to correct the inaccurate impressions received by readers from statements made by his interviewees. “Standing inside, his face hidden, is a fighter, with the nom de guerre, Abu Hamza. “Our biggest achievement is that we stood our ground, and we challenged the occupier,” said Abu Ibrahim, a commander of their Saraya al-Quds brigade. Sommerville continues the practice of promoting casualty figures which have not been independently verified by the BBC. His emotive descriptions of the Gaza Strip lack context and no effort is made to clarify to readers that the factor most hindering reconstruction in the Gaza Strip is infighting between Hamas and the Palestinian Authority. “Large parts of neighbourhoods in Gaza are in ruins, and the Strip is in the midst of a humanitarian crisis which has left many thousands of families homeless. Sommerville’s take-away message in both these reports is that the “next confrontation” between Israel and terrorist organisations in the Gaza Strip is just a matter of time. Whilst that supposition is entirely reasonable, he fails to present BBC audiences with the information they need in order to be able to properly understand why that is the case. The fact that he refrains from accurately defining the Palestinian Islamic Jihad and Hamas as terrorist organisations, along with his overall failure to clarify to BBC audiences that any future hostilities depend entirely upon the choices made by those groups and his concurrent promotion of myths such as the non-existent “occupation”, means that readers and viewers remain none the wiser about the real causes of the war around the corner. In addition, Sommerville’s avoidance of the issue of the PIJ’s Iranian backing and the sources of its rearmament mean that a crucial piece of the overall picture is concealed from BBC audiences and hence, what could have been informative journalism is instead disappointingly predictable and superficial, tapping into the same themes recycled by the BBC so many times before. 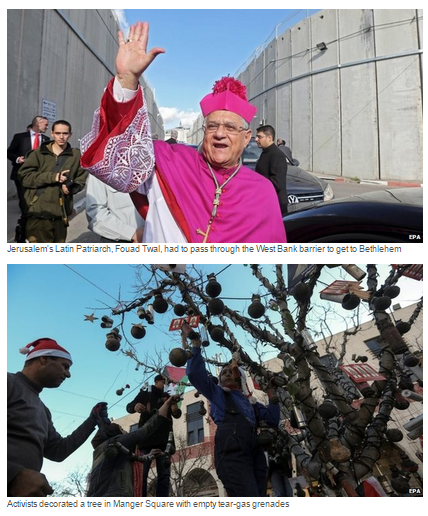 Attempts to co-opt Christmas for Palestinian political messaging are nothing new and neither is the BBC’s collaboration with those public relations campaigns. In previous years we have seen Jon Donnison and Yolande Knell using the occasion of Christmas Eve celebrations in Bethlehem for opportunistic promotion of political messaging. This year coverage of the celebrations was assigned to Quentin Sommerville who managed to produce a reasonable filmed report free of political messaging. 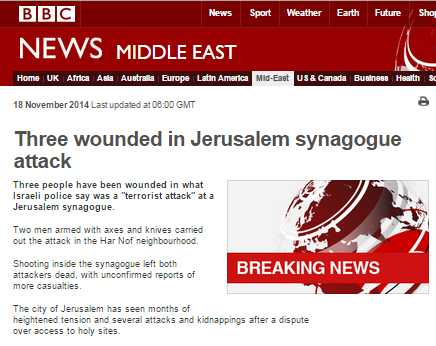 The accompanying written article which appeared on the BBC News website’s Middle East page, however, was not. Titled “Christians hold Christmas Eve Mass in Bethlehem“, the report was amended no fewer than five times and those changes can be seen here. Just under 40% of that report’s word count is devoted to context-free amplification of political statements with descriptions of the religious celebrations themselves barely appearing in the article. “In a homily, Latin Patriarch Fouad Twal called on Jews, Muslims and Christians to “live together as equals”. “Patriarch Twal, the most senior Roman Catholic cleric in the Holy Land, said the region had become “a land of conflict”. “I hope next year there will be no separation wall and I hope we will have bridges of peace instead,” he said, referring to the barrier Israel is building in and around the West Bank, which separates Bethlehem from Jerusalem. Israel says the barrier is necessary to prevent attacks by militants. As usual, the proven effectiveness of the anti-terrorist fence is ignored by the BBC – along with the events which brought about its construction – and the reason for its existence presented in the partial language of “Israel says”. Readers are not reminded that the summer conflict lamented by the Latin Patriarch was instigated by Hamas or of the obviously relevant issue of continuing Palestinian terrorism against Israeli civilians. Additionally, the writer of this report saw fit to use it as a hook for the promotion of quotes from the PA Minister for Tourism. “His sentiment was echoed by Palestinian Tourism Minister Rula Maayah. “Our message this Christmas is a message of peace like every year, but what we added this year is that all we want from Christmas is justice,” the minister said. 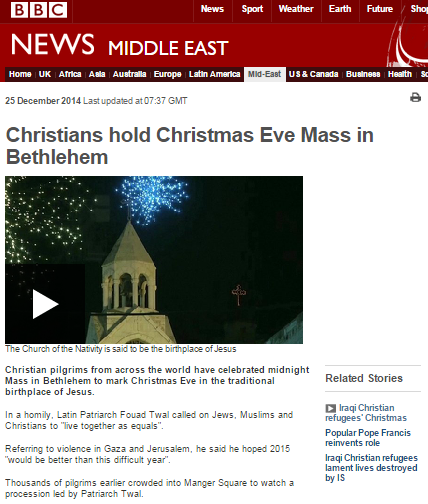 Readers are not informed that the phrase ‘all I want for Christmas is justice” is the official Christmas political campaign slogan chosen this year by Ms. Maayah’s department and neither are they told anything about the circumstances of how that quote reached the BBC just in time for its Christmas Eve report from Bethlehem. Similar messaging was apparent in some of the images chosen to illustrate the report and their captions. If readers of this article assumed that – as suggested in its title – they were going to learn something about the celebration of the religious festival itself in Bethlehem, they were of course mistaken. Instead, the BBC has once again self-conscripted to the opportunistic exploitation of Christmas for promotion of context-free PA political sloganeering. On the morning of December 19th a missile fired from the Gaza Strip hit the Eshkol region of the Western Negev in the third such incident since the ceasefire in late August which brought the fifty-day summer conflict between Israel and Gaza-based terrorist organisations to a close. 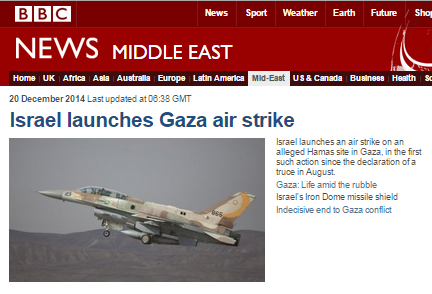 Like those previous incidents of missile fire, this one too was not reported by the BBC at the time. During the night between December 19th and 20th, the Israeli air-force launched a retaliatory strike against a Hamas military installation near Khan Yunis. That event was considered news by the BBC. Jerusalem bureau correspondent Quentin Sommerville did inform his 24 thousand followers that the Israeli action came in response to missile fire, whilst taking the opportunity to revive the well-trodden BBC theme of “home-made rockets”. There is no evidence to suggest that Sommerville was at the scene of the impact and hence his ‘diagnosis’ of the missile’s nature is apparently based on guess-work. Equally questionable is Sommerville’s geography: there is no city called Eshkol: that name refers to a regional council. 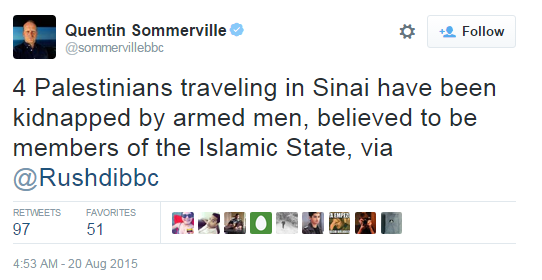 Nevertheless, that inaccurate information was retweeted by the BBC World Twitter account. More context-free ‘last-first’ reporting was seen on the BBC News website’s Middle East page on the morning of December 20th where visitors were informed that “Israel launches an air strike on an alleged Hamas site in Gaza, in the first such action since the declaration of a truce in August”, but with no mention in the headline or sub-heading of the missile attack several hours beforehand. That headline leads to an article titled “Israel launches Gaza air strike on ‘Hamas target’” which fails to clarify to BBC audiences that this latest missile attack was the third since the end of August. Readers will note that one of the recommended articles presented on the BBC News website’s Middle East page with that article is headed “Gaza: Life amid the rubble” which was discussed here. Whilst the BBC has put much effort in recent months into the production of numerous ‘reporter in the rubble’ items showcasing the topic of damage to houses and infrastructure in the Gaza Strip (see some additional examples here, here and here), it has refrained from carrying out any reporting whatsoever on the subject of Hamas’ reconstruction of its military infrastructure, including cross-border tunnels and missile capabilities. Once again licence fee-payers relying on the BBC to meet its half of the bargain by providing them with reporting which will enhance their understanding of international issues are being sold short. Nowhere is that more apparent than in the corporation’s continuing policies of ‘last-first’ reporting and framing by omission. 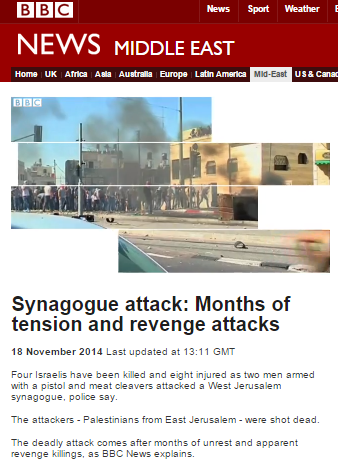 Since late October much of the BBC’s Israel-related subject matter has been focused on the surge in terror attacks and violence, with an integral part of that coverage being ‘explanations’ to BBC audiences of its supposed causes. 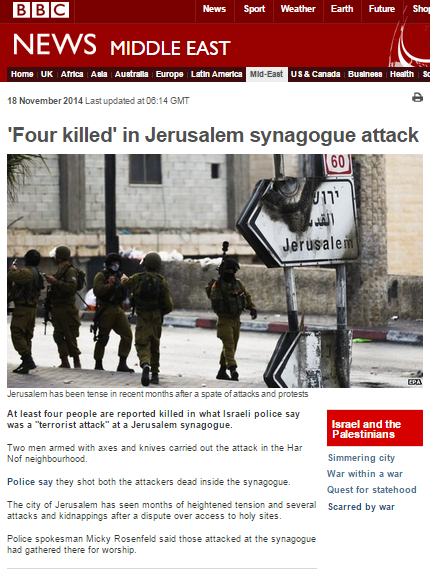 As was noted in a previous post concerning BBC coverage of the November 18th terror attack in Har Nof, the factors promoted by the BBC as causes for that attack included (in reverse order of frequency) ‘discrimination’ against Arab Jerusalemites, a ‘cycle of violence’, supposed ‘attacks’ on or threats to Al Aqsa Mosque by Jews, the absence of negotiations between Israel and the PLO, the Gaza casualty toll of the summer conflict, the campaign for equal prayer rights at Temple Mount and ‘settlements’. 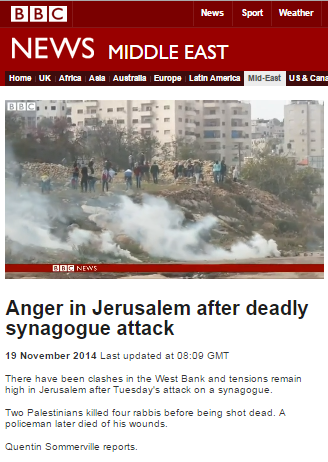 The fact that so many and such varied factors were promoted as being the cause of “tensions” which, according to the BBC led to two Palestinians carrying out a brutal terror attack on early morning worshippers at a synagogue, of course indicates that the promotion of one factor or another in BBC reports depended very much upon the particular journalist. 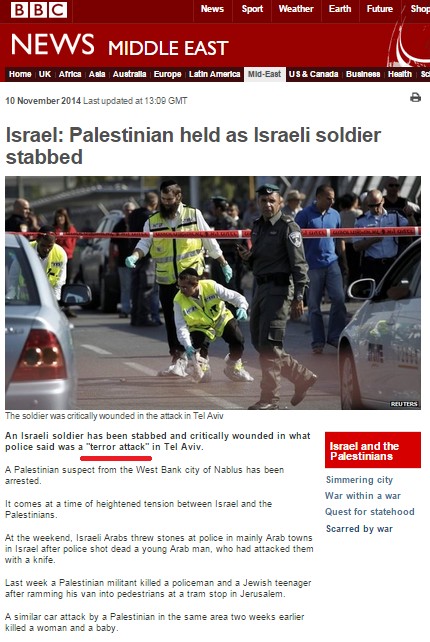 In contrast, the subject of incitement and glorification of terrorism by Palestinian functionaries and official Palestinian sources was presented uniformly and exclusively in the form of second-hand quotes, with the BBC making no effort whatsoever to independently inform audiences of those factors and their role in the creation of “tensions”. In this post we will take a broader look at BBC coverage of other incidents which took place between late October and late November and examine the narrative promoted in the reports below. October 22nd: terror attack on light rail passengers, Ammunition Hill, Jerusalem. October 29th: shooting of Yehuda Glick in central Jerusalem. November 5th: terror attack on light rail passengers & pedestrians, Shimon Hatsadik, Jerusalem. 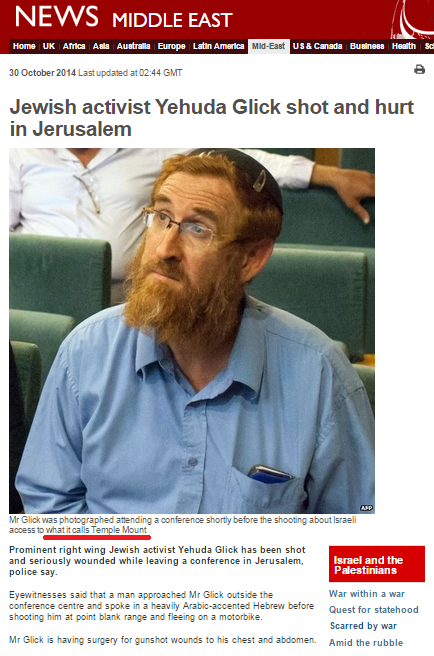 As was the case in BBC coverage of the Har Nof terror attack, any use of the word terror or its derivatives in the above reports came in the form of quotes from (mostly) Israeli or American officials and in inverted commas. 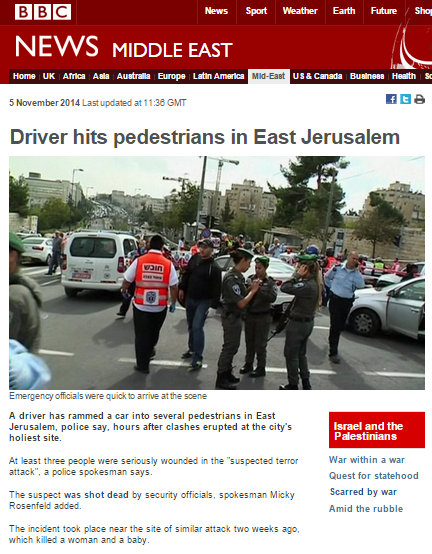 On no occasion did the BBC independently identify the incidents as terror attacks or the perpetrators as terrorists. Likewise, all mentions of incitement propagated by Palestinian leaders in the above reports were presented to BBC audiences in the form of quotes from Israeli officials: no independent reporting on that issue was provided by the BBC. In addition to the factors presented as causing “tensions” – and hence terrorism – appearing in the reports on the Har Nof attack, in the reports above a number of additional factors were to be found. On two occasions audiences were told that “tensions” had risen because Israeli security forces had killed Palestinians, on three occasions they were informed that “tensions” had risen because Israel had confiscated or demolished Palestinian homes (with no context provided) and on eleven occasions audiences were told that age restrictions and/or the closure of Temple Mount were the cause of “tensions”. Once again the prime factor promoted by the BBC as context for the surge in violence and terror attacks was ‘settlements’. Taking the above articles together with the coverage of the Har Nof attack, we see that factor has been promoted by the BBC more than any other. Like the vast majority of the additional factors presented by the BBC, that one too would be perceived by audiences as Israeli action and thus the underlying message is that Palestinian violence and terrorism is attributable to rising “tensions” caused almost exclusively by Israeli actions. Another interesting aspect of the framing seen in BBC reporting was that of the use of political labelling – or not. The people (according to the BBC’s narrative) driven to violent rioting and terror attacks on civilians because of “tensions” caused by a campaign for equal prayer rights for non-Muslims at a site holy to Christians, Jews and Muslims alike – and those inciting them to such actions – were not afforded any kind of political label in any BBC report. In contrast, the BBC did find it necessary to describe to its audiences on numerous occasions the assumed political affiliations/stances/opinions of the people visiting Temple Mount and/or the people campaigning for equal rights there for people of all faiths, as can be seen in the few examples below. “Fears that Israel is set to legislate to remove the ban have led to furious scenes as Palestinian Muslims try to block visits by parties of far-right, religious Jews escorted by Israeli police. On other occasions, the campaign for equal prayer rights at Temple Mount was inaccurately portrayed as an “Orthodox” issue. 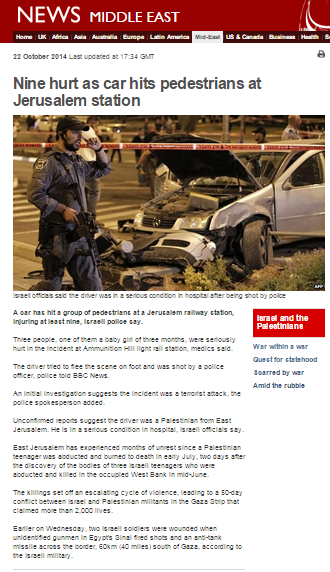 “The driver of the van – named as Ibrahim al-Akari – was from Shuafat refugee camp in the east of the city, police said. BBC reporting on the surge of violence and terror during October and November 2014 was largely limited to fatal attacks, with dozens of other non-fatal incidents ignored. As we see, the reports adhered to a specific template which ‘explained’ events by attributing them to “rising tensions” caused almost inevitably by Israeli actions. For over a month, audiences have been provided with a picture of Israeli action and Palestinian reaction: a narrative which includes no Palestinian responsibility or agency and is carefully framed to exclude one of the story’s most important elements – the crucial issue of the repeated incitement and glorification of terrorism by Palestinian leaders and official organisations, with no independent BBC reporting on that issue having appeared at all to date. In short, the BBC’s obligation to “build a global understanding of international issues” has once again been trumped by a political narrative. The day after the terror attack at the synagogue in Har Nof – November 19th – the BBC Jerusalem Bureau’s Quentin Sommerville produced a filmed report titled “Anger in Jerusalem after deadly synagogue attack” which appeared on the BBC News website as well as on BBC television news. Of course there are no actual threats to the Al Aqsa Mosque or any other “important Muslim site”: the only ‘threats’ which exist are the mythical ones invented by Palestinian leaders in order to incite the population to violence. Not only does Sommerville fail to clarify that point to BBC audiences, but he goes on to state that the terror attack in Har Nof should be understood as having been “motivated” by what are in fact non-existent ‘threats’. Sommerville fails to correct the misleading impression given to viewers by Abbas’ words by informing them that there have not been any “attacks against Al Aqsa Compound”. It is the BBC’s job to enhance audience understanding of international affairs by means of accurate and impartial reporting. The corporation cannot achieve that aim if its correspondents simply regurgitate Palestinian propaganda whilst making no effort to inform audiences of the facts behind that deliberate misinformation. 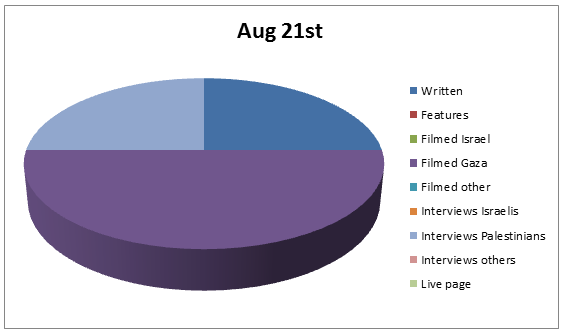 In the first four installments of this post (see ‘related articles’ below) we documented BBC News website coverage of the first forty days of Operation Protective Edge. Part five relates to the final ten days of the conflict and the day after the ceasefire agreement was reached: August 17th to August 27th 2014 inclusive. Gaza-Israel conflict: Is the fighting over? As was also the case in the previous ten days of the conflict, the period between August 17th and August 27th showed a drop in the amount of content produced by the BBC in comparison with its coverage of the first thirty days of hostilities after the number of journalists working in the Gaza Strip was reduced and media attentions shifted somewhat to the ISIS-related events in Iraq and Syria. 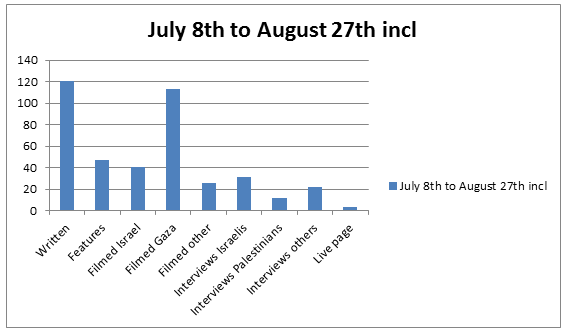 However, BBC audiences still saw over four times as much filmed content depicting the situation in the Gaza Strip as they did concerning the situation in Israel. 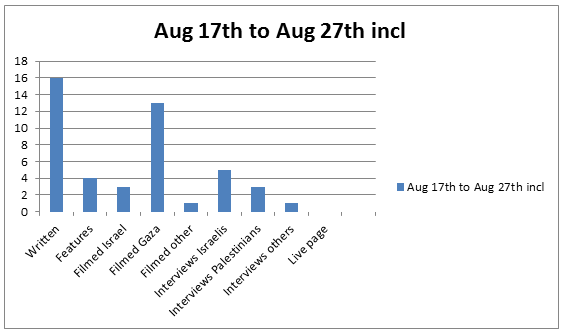 BBC promotion of Hamas’ demands to lift border restrictions remained a prominent theme in the final days of coverage. The theme of Gaza’s damaged infrastructure – also a popular topic in the weeks since the conflict’s end – also continued to be promoted. The BBC continued to misrepresent the terrorists’ breaches of truce agreements and bizarrely and misleadingly portrayed the ceasefire negotiations held in Cairo as “peace talks”. Missile fire into Israel was again severely under-reported. 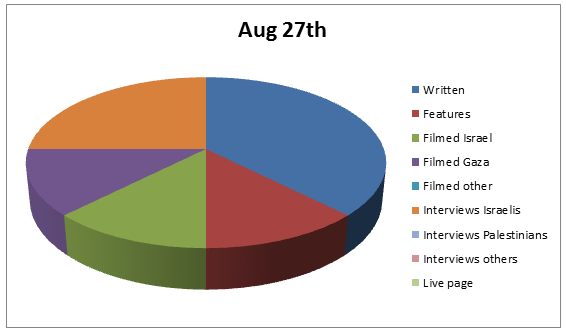 In the period between July 8th and August 27th, four hundred and sixteen separate items of content (not including the exceptions noted above) appeared on the BBC News website’s Middle East page; an average of over eight items a day. 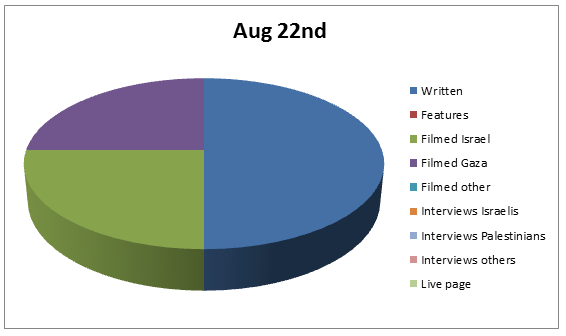 The predominant type of report presented was written news reports – 121 in total. 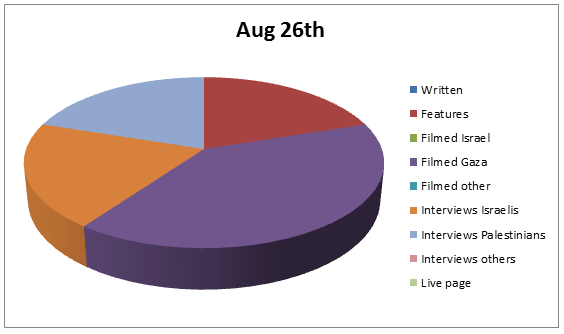 Over a quarter of the content made available to visitors to the BBC News website came in the form of filmed reports depicting the situation in the Gaza Strip (also shown on BBC television news programmes). Throughout the entire 51 days of coverage, BBC audiences saw nearly three times more filmed reports from the Gaza Strip than they did comparative filmed reports from Israel. Another interesting aspect of BBC coverage is to be found in the wording of the headlines used to present reports. The most frequently appearing wording for headlines included the categorization of their topic as the “Gaza conflict” (85 reports) with that term being employed from day one of the hostilities. The categorization “Gaza crisis” first appeared on the conflict’s fourth day and was to be found in 38 headlines. Day two of the conflict saw the appearance of the term “Middle East crisis” and that description was used in the titles to twenty reports. Headlines reflecting the fact that the conflict was also taking place in Israel – using the terms “Israel-Gaza conflict”, “Israel-Gaza crisis” or “Gaza –Israel” – appeared in only 22 reports in total. 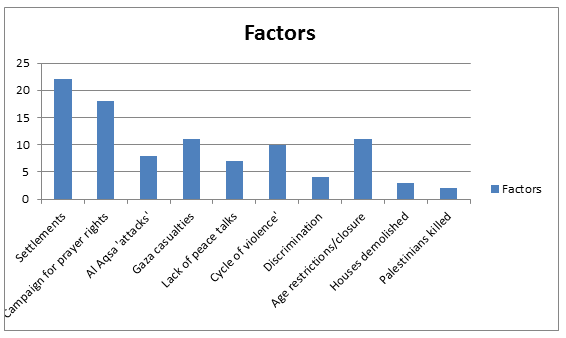 Thus, as we see, both in the signposting to audiences by means of headline composition and in the proportion of filmed reports from the Gaza Strip compared to those depicting the situation in Israel, the BBC’s presentation of the conflict was heavily tipped towards focus on its effects upon the civilian population of the in the Gaza Strip, indicating that the corporation’s claims of “equal coverage” and “fair balance”of the two sides of the conflict do not stand up to scrutiny.